This drive-through display transforms more than a mile of the beautiful Lehigh Parkway into a winter wonderland with thousands of twinkling lights, animated displays and accompanying music. After the journey through the spectacular displays, we stopped by the Gift Barn which hosts vendors selling everything from candies to handmade treasures. 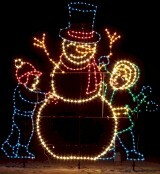 This year Lights in the Parkway runs from December 5, 2008 – January 4, 2009 (closed Christmas). Nightly the lights shine from 5:30 – 10:00 pm.